US President Donald Trump has confirmed his intention to pull the country's troops from Syria, explaining that the US military presence on Syria's soil has benefited other countries more than Washington itself. "Our primary mission in terms of that was getting rid of ISIS [Daesh]. We've almost completed that task and we'll be making a decision very quickly in coordination with others, as to what we'll do. Saudi Arabia is very interested in our decision," Trump stated during a press conference with the heads of the three Baltic states. "I want to get out. I want to bring our troops home." US media reported on Friday that Trump has ordered the suspension of more than $200 million in funds for recovery efforts in Syria. The statement follows Trump's previous announcement, made on March 29, pledging to allow a United States' withdrawal from Syria "very soon" and "let the other people take care of it" instead. Trump's surprising decision contradicted previous comments coming from his administration, including senior Pentagon and State Department officials, saying that American troops would maintain an open-ended presence in Syria. However, a contradictory position has been voiced in response to this statement by Bret McGurk, Trump's special envoy to the US-led coalition, who stated that the coalition's mission in Syria is not over and the US would stay in the country until the terrorist group is defeated. "In terms of our campaign in Syria, we are in Syria to fight ISIS [Daesh]," McGurk said during remarks at the United States Institute of Peace in Washington, DC. "That is our mission and that mission isn't over and we are going to complete that mission." 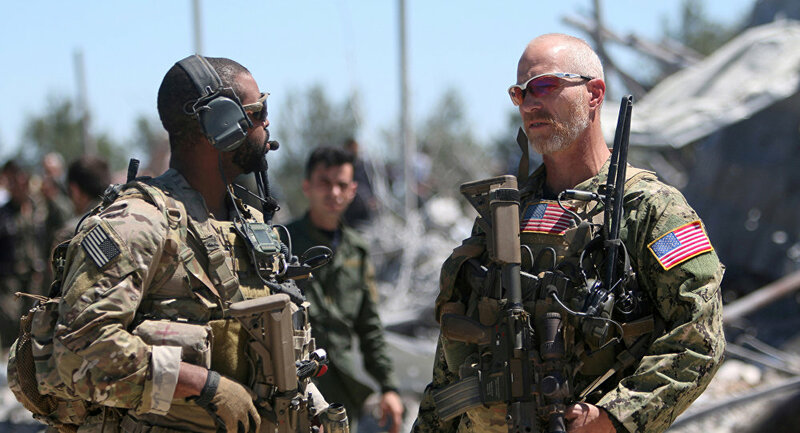 The US has been maintaining a military presence on Syrian soil since 2014, leading a coalition of allies in fighting against Daesh, without either a UN mandate or the Syrian government's authorization. Damascus has consistently called the US military presence in the country "illegal." The US president has also touched upon the strained relations with Moscow, speaking during the press-conference. "I think we’ll be able to have great dialogue, I hope," Trump said during a briefing alongside the presidents of Estonia, Lithuania and Latvia. "Nobody has been tougher on Russia than I have… With that being said I think I could have a very good relationship with [Russian] President [Vladimir] Putin, I think. It’s possible I won’t, and you will know about it." He went on saying that it was not right for Germany to spend billions on energy from Russia while failing to meet its two percent-of-GDP commitment to NATO. "NATO is taking in billions of dollars more because of me… Many of the countries were not paying, and even now Germany is paying one percent, and they are not even paying a full one percent," Trump said. "Germany hooks up a pipeline into Russia where Germany is going to be paying billions of dollars for energy into Russia. And I am saying what’s going on with that? How come Germany is paying vast amounts of money to Russia where they hook up a pipeline? That’s not right." The Nord Stream 2 AG, the operator of the Nord Stream 2 gas pipeline project, received all permits from Germany necessary for the construction of the pipeline, the company’s press service said on Tuesday. Germany has repeatedly said the project is a commercial and economic enterprise, and that countries must abide by this principle. Earlier in March, a group of 39 US senators urged the US Treasury Department to try blocking the construction of the Nord Stream 2 gas pipeline and consider imposing sanctions on companies involved in the project. Nord Stream 2 is a joint venture between Russia's Gazprom and France's Engie, Austria’s OMV AG, UK-Dutch Royal Dutch Shell, and Germany's Uniper and Wintershall. The project aims to deliver 55 billion cubic meters of Russian natural gas a year to the European Union across the Baltic Sea to Germany. The project has been welcomed by some countries in Europe, such as Germany and Austria, and opposed by others, including eastern European states, which currently transfer Russian gas to Europe and may suffer transit revenue drops if Nord Stream 2 becomes operational. NATO member states have a commitment to dedicate two percent of GDP to boosting alliance military capabilities.